If you are a smoker, and you are reading my blog now, don't get offended. Life is short, Just do it, Break The Rules, But Know The Boundaries. Now, how cruel (or sarcastic) is that? I hate smokers. FIL used to be a heavy smoker. But he has stopped now due to lung problems. Let me story you. Many many donkey years ago, when we were still dating, we were saving up to buy a house and to get married. Then FIL was admitted to hospital due to lung problems as he has been coughing for the past few months. All these due to his smoking problems. Spent a lot of money on operations, checkups, you know, those small little things, those small little visits to the hospital every now & then, hubby and BIL paid for the bills as they are the sons (and yes, we had to delay in buying the house due to money issues, hubby had to borrow money from his brother to settle some debts and all. Ooops, too much said here). So yes, I hate smokers. Period. Someone promised to quit. And he did. 10 months ago. And now, 10 months after, I just got to know he's on the ciggy again. I asked why coz he'd promised to quit. He said: No reason, just feel like it, that's all. I don't have to report to you right. I have a lot of things to think about. When I smoke, I can forget about them for a while. So, it's true a leopard can't change its spots. I hate people who never honor their word. 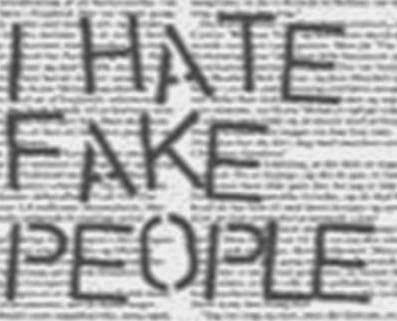 I hate fake people. Morning Xiao Ying.. They stink too..
Oh dear. I guess it is not so bad if they are responsible smokers, like responsible drinks - for instance, they can go far far away from other people to smoke, do it in open spaces (and especially not in public and aircon places), don't throw away the butts indiscriminately and things like that - especially considering that it is not easy to kick the habit. I think he has become a regular smoker back now.. Smoking when others are smoking, you know, it's like you want to do it coz others are doing it too, if you don't, then you are "uncool" and the "odd one out"..
Hi Louiz! Me too do not like smokers. I hate walking behind them especially if the wind in blowing from the front. All the smoke gets into my face so I faster walk ahead of them. There are some people downstairs my office who like to smoke at the staircase landing and the smoke drifts up to my place. Ugh! I understand your frustration when someone in the house smokes! And break his promise to stop! Luckily for me, no one in my immediate family smokes. The last person was my late grandfather. Hope your hubby has a rethink about his smoking habit. It's bad for him and you and the kids. Oh yes, I feel you.. In my condo, that person smoked from downstairs.. So the smoke "flew" upstairs, to my place.. And my whole house will smell of smoke, yucky ! I think it's really hard to quit smoking...it's not as hard as some other things, but it's still hard. People are human, we sometimes make promises we can't keep and although we mean well, we sometimes do things or say things which we don't mean which can hurt others. I hate those Japanese expats smoking in restaurants in jb.its air cond but they can't be bother and just smoke despite there are children there. And we thought they are culturally very well manners. Shame on them. Eh, I thought they are very polite and responsible one? Hmm, now I know..
Not do I know or they behaved in their country ? cannot say i hate all smokers lah, but probably just hate those irresponsible smokers.. those who smoke but thought of the comfort of others surely shall not be hated lah, the most you dislike them only..
Hmm, ya hor, but aiya, nevermind la, my blog, my sukak la.. Maybe too spicy la my words, but well, I am myself ma, hehe..
now these are those i hate.. Same here.. But this one I lagi hate: They smoke coz others are smoking. Or they smoke coz their boss smokes too, so they wana ambil hati.. They smoke coz they don't wana be the "odd one out".. Now, this one I hate most! I like WKG !! For a moment, I'm thinking what is WKG.. Ooohh, now I figured it out liao.. Nice initials, I like! Smokers will like back smokers lor, kekeke.. I am the same like you. I really dislike smokers. I wish it would be compulsary for them to wear a fish bowl over their own heads to keep the smoke from getting out. The worse thing is hearing about non smokers dying from lung cancer because of the secondary smoke that they breathe in from smokers. The governments should really ban smoking but due to this money minded world it is not banned because the smoking industry makes a lot of money from smokers and pay tax to the government. The thing is now I see many young girls smoking too. I wonder why did they even start smoking? Yeah, more & more youngsters smoking now.. I think they feel "cool" kua.. Like very "yau ying" like that.. Face pretty, wear decent, but open mouth only all the vulgar words out, plus smoking also, wahlao..
Will shock tactics stop your half from smoking? Say you will smoke too if he smokes. I am sure he does not want you the mother of his sons to smoke too. I have blogged few times about my office hantus who smoke heavily. My boss has died of lung cancer in May and everyone is still smoking away like there's no tomorrow. Nothing will stop them lah. Lung cancer is very very painful and the patients often wanted to die faster. Sometimes you just light the cigarette and let it burn on the ashtray till end. Reply his that you also burn away money and use that way to chase away dengue mosquitoes! I was a smoker since secondary school days and have stopped smoking for over 15 years now! High 5! I HATE smokers too! I just wonder why people would willing to spend money buying cigars even though it's getting expensive?! Do the maths and you'll be surprise at how much you can save every month! Plus smoking brings no benefits at all, not just harmful to the smokers but also to the innocent people around! Why would people still wanna continue smoking? Yep, I think most excuse people give is that smoking releases stress, and it can make them forget about stress - even for a few seconds.. Sigh..
Haha, but did you try to ask him to stop? I guess it won't be easy? I think that fella breaking his promise pisses you off more than his smoking eh? I don't like smoking too. That's one of the reason I run away from KL to Penang. When I was in college, whenever we had a gathering, only 1 or 2 person smokes and the rest of us scold them. Nowadays when I come back to KL for gathering, I am the only non-smoker @.@". You are so right.. It's the person breaking his promise, not so much of the smoking issue.. Clever.. I hate, very hate smokers... especially those who smoke and blow them to your face, or those who just smoke thinking that they look good with ciga on their fingers when eating.. chaohai... sometimes i really don't understand why can't they be more considerate !!!!! They think it's cool and "yau ying" to smoke when their boss is smoking also kua, paiseh or dare not reject kua, when the boss ask them to puff..
Ommm omm...hate is such a strong word....my form 5 teacher taught us never go use the word hate ....better to use dislike. i don't think in this world there are people who don't hate fake people. lol. but yeah. smoking is a truly disgusting habit. one that i will never fully understand. dating a smoker & a non-smoker, what a world of difference!! i will never ever date a smoker ever again. lol.